Casa Mia Sunshine does combine perfect location, amazing house, comfort, distinction and good taste. 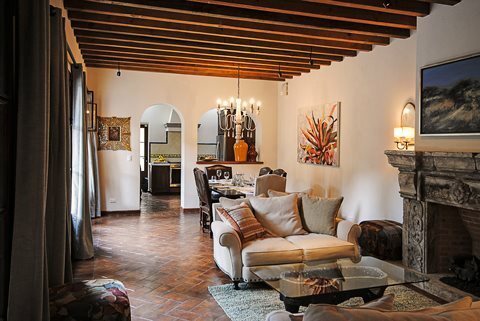 The house is conveniently located next to the hotel Villa Santa Monica known to all frequent travellers to San Miguel. The Juarez park is right in front of the house and gives you a feeling of being surrounded by nature. On the other side of the park , you will enjoy the commodity of 2 other famous hotels in San Miguel (namely the Rosewood hotel and the Matilda Hotel). The house has 2 entrances, one located in Baeza Street and the other entrance is inside the gated community for more privacy. There is parking inside the gate. Whether you enter through one or the other entrance, you will be mesmerized by the architectural details, decoration and the attention to detail of this house. The first floor combines the living room, dining room, kitchen, one bedroom, a small office and an amazing patio with an old pecan tree to the side. The living room and dining room area is ample and comfortable. You can cosily sit in front of the old carved stone chimney and enjoy the glow of the gas fireplace. 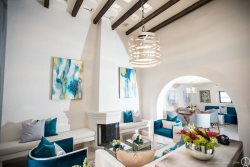 In the adjoining office, you will find a wine cellar and an ice maker with all the amenities necessary to prepare a perfect cocktail. The kitchen is fully equipped with state of the art appliances and purified water system throughout the house. There is an additional outside living room and dining room if you want to enjoy San Miguel's beautiful weather. The bedroom on the ground floor has 2 queen size bed and a sitting area. It opens up to the main patio and has its own en suite shower room and a walk in closet. The second bedroom has a King size bed and french doors that opens up to the main patio of the house. This bedroom has a walk in closet and an large shower room with Talavera tile. All bedrooms have air conditioning and a flat screen TVs. There is WIFI throughout the house. The maid goes to the house from Monday to Friday from 9:00am to 3:00pm. On Saturday, she will be there until 1:00pm. Small children and pets are not allowed in this house.